I needed some shop time that wasn’t just about sweeping and vacuuming the entire shop, the shop does look great but whats the point of having a workshop if you are not making saw dust and actually making something, to be honest it was so clean it made me a little nervous of dirtying it up again, lol. So I went to my bucket list of shop projects and picked one that I wanted to do, I have amassed a few assorted squares since picking up wood working and its one of them tools that never really had a home so a couple of months ago I found this project Jay Bates website @ JaysCustomCreations.com and it addressed this issue that I was having, I really liked at the simplicity of the project and it actually works really well, I will include a link to the build article in this blog. Its basically another French Cleat design and since I had some leftover room on my solitary french cleat wall I decided it was a great place for it. Here is a summary of what went into the project today. Like I previously mentioned I came across this project on Jay Bates website Jayscustomcreation.com he is one of the woodworkers that I follow from time to time and he also has a YouTube channel. This project is great to use up some scrap materials and that is exactly what I did. Usually when I want to make a project I usually fo to my computer and make a 3D model of what I want to make but this time was different I made this project on the fly simply because I needed to see the actual tools in position to determine how big the back was going to be, so sorry no Sketchuop model on this. Some 2 x material I had some poplar, pine and oak just lying around so I used that. Here are the steps of the build that I took I didn’t take that many pictures of the build but you can follow along with Jays article that I included at the end of the blog post. 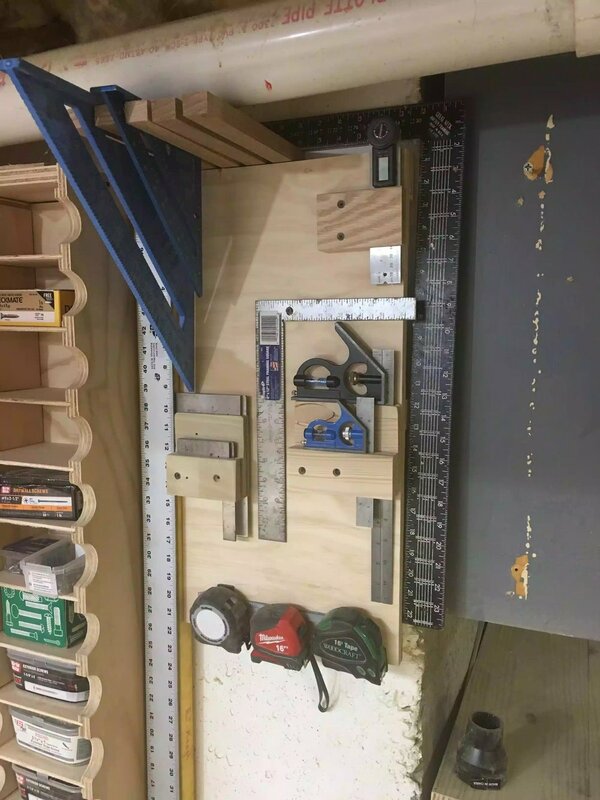 I laid out all the different types of squares that I had, I had some speed squares, machinist squares, combination squares and a few other items that I wanted to include on the organizer, I needed to lay out everything to figure out spacing of where everything was going to fit. I started ripping & cross cutting some oak to use as hangers for the speed squares, then I predrilled the backs of them so as that I could screw them into the top of the backer board. Then I made a holder for my combination & machinist squares this took a little more work but its basically a piece of 1-1/2” thick material that I cut a big rabbit out of to create a shelf doe the square to sit on, this way I could fit sizes to each work-piece. 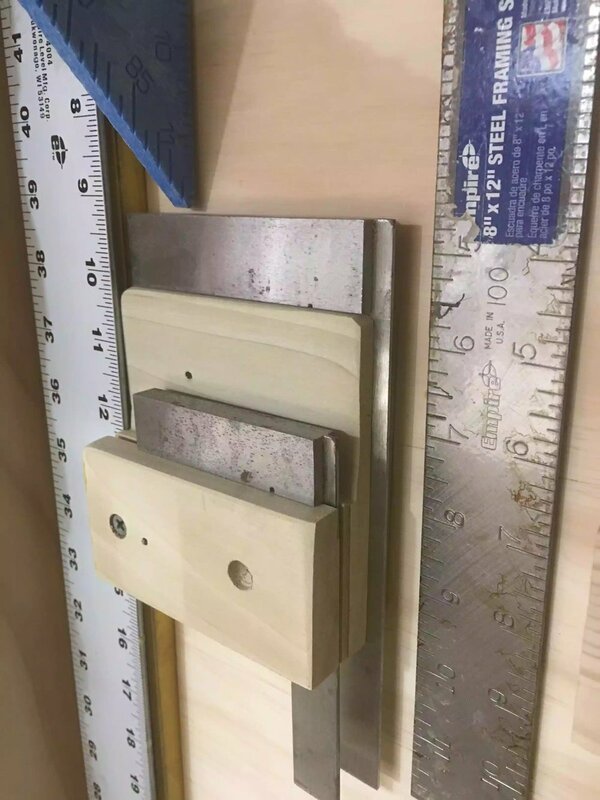 Finally I took a hacksaw blade and drilled two holes on each end, then I used a screw to secure the blade onto the backer board I also used some really small washers to give clearance, I will be using this to mount some measuring tapes to. Here is what it looks like now all nice and neat and everything has its place. 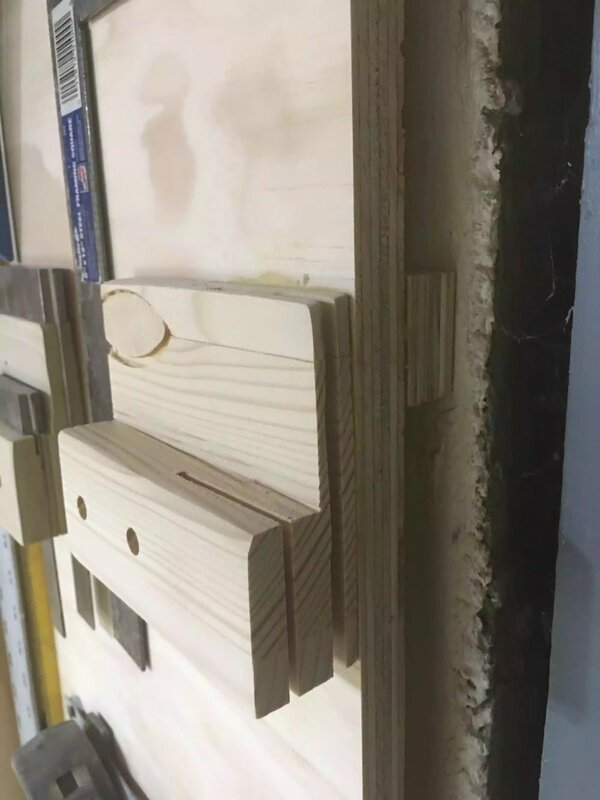 The holders are nothing more than a block of wood with some strategically placed Kerf cuts so the tool can slide in and out. A hacksaw blade provide easy measuring tape storage. I used a hacksaw but a piece of aluminum flat bar would also work. All in all I am very happy about how this project turned out and even happier that it didn’t cost me a penny. Thanks for tuning into this blog and I will catch you later.